The holidays are getting closer and today we are looking for a special destination, in a privileged Cantabrian environment. We propose seven charming rural accommodations in the heart of Cantabria, to spend unforgettable days. From wild beaches to the Picos de Europa, we take as a base houses, hotels and even charming villages to discover Cantabria, one of the best destinations in 2018 according to Lonely Planet and to which we always want to return. Near San Vicente de la Barquera we find the Molino de Bonaco (cover photo), a luxury residential complex designed for the rest of its guests. An old restored mill, “El Pajar” and up to seven independent houses decorated with an exquisite taste and surrounded by a bamboo garden, a stream and 38000 square meters of own property ensure the tranquility of the traveler. Posada Lindos Sueños is a typical mountain construction that has attic rooms in which to take refuge or from which to plan your visits. Posada Lindos Sueños is located in the Campoo Valley, surrounded by oak and beech forests, in a unique natural setting, surrounded by mountains of more than 2000 meters. Routes on horseback, bicycle, kayak, caves, Romanesque, castles, golf … and skiing in winter are some of the possibilities near this charming rural accommodation in Cantabria. In the heart of the Liébana Valley, in the Medio neighborhood of Acebaña, is El Covaju, a charming rural complex, that we can enjoy in cozy apartments or in complete houses. 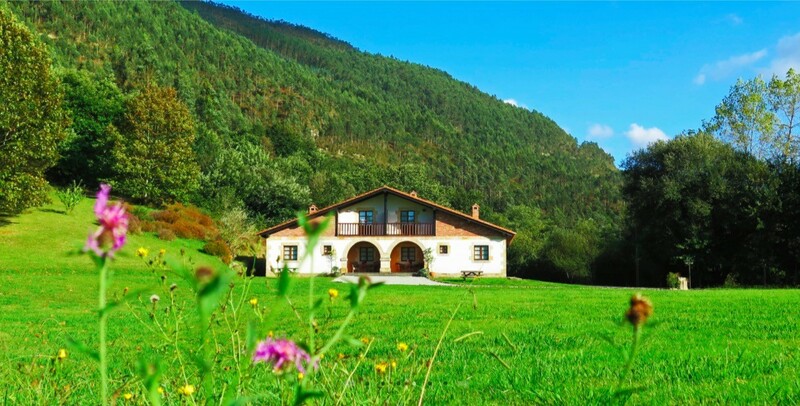 A whole neighborhood restored in a mountain village with a unique character, with views of the beech, oak and chestnut forests of Liébana and the Peña Sagra peaks. It has all the amenities and in the common areas there is a heated outdoor pool, jacuzzi and sauna. The Hotel Rural El Jardín is located in Soto de la Marina, Cantabria, very close to Santander, a quiet place, ideal to unwind and also to plan the best tours of the province. In a privileged environment, we can take refuge in a room with a hot tub, get lost in the garden or sunbathe by the pool in summer and then rent a bicycle to discover the beauty of the Costa Quebrada. Strategically located in Santillana del Mar, one of the oldest towns in the region, La casa del organista is the old mountain mansion of the organist of the collegiate church of Santillana , from the 18th century, in the historical center, which offers a sober and cozy refuge . It was carefully restored by artisans stonemasons and carpenters with the warmth of wood and earth stone and offers excellent views of the collegiate church. The Hostería El Pomar has a tower-style mountain house that was founded in the 17th century, a former manor palace and formerly a posada on the Camino Real that linked Oviedo with Santillana del Mar. Hostería El Pomar is located in the quiet village of Novales, belonging to the municipality of Alfoz de Lloredo, surrounded by forests and meadows. Made with earth materials, it combines oak and chestnut wood with ashlar stone and masonry. It has new facilities in an annex, a small spa and an outdoor pool to enjoy a refreshing swim in the garden.